Steve Riley has recruited Orlando, Florida-based guitarist/vocalist Kurt Frohlich to front his version of L.A. GUNS at next month's M3 Rock Festival. Frohlich's addition to the group was confirmed via a graphic posted on the Facebook page of Riley's L.
In addition to Frohlich and Riley, the L.A. 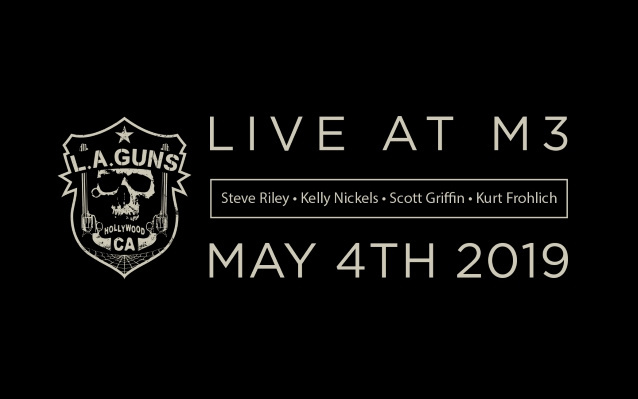 GUNS lineup that will perform at M3 will include bassist Kelly Nickels (a member of L.A. GUNS' "classic" incarntion) and guitarist Scott Griffin (who played bass for the band from 2007 until 2009, and then again from 2011 to 2014). The May 4 concert will mark the first time ever that an L.A. GUNS performance will not feature singer Phil Lewis or guitarist Tracii Guns, who are currently playing together in their own version of the band. A dozen years ago, Frohlich was recruited to front a second incarnation of FASTER PUSSYCAT by three of the group's original members, who were unhappy with both the musical direction of the band and singer Taime Downe's "drunk and erratic performances." At the time, bassist Eric Stacy said that the Frohlich-fronted FASTER PUSSYCAT would perform the band's songs "the way they were written and recorded." Soon after a European tour in the spring of 2007, the second version of FASTER PUSSYCAT disbanded. The Downe-fronted version of the group continues to tour regularly to this day. Frohlich has also played with Marky Ramone and a group called THE UNDERGROUND REBELS. He performs acoustically in the greater Orlando area on a regular basis. Riley is the longest-tenured member of L.A. GUNS, a group he joined shortly before the release of their 1988 self-titled debut. (While he is pictured on the album, he did not actually perform on it.) Although the band has famously featured more than 50 members in its ranks through the years, with the exception of a two-year period in the early 1990s, Riley was the sole constant from 1987 until the end of 2016, when the group that he and Lewis managed to keep alive for nearly 15 years without founding guitarist Guns (who quit the band in 2002, on the eve of the release of their acclaimed album "Waking The Dead") dissolved. Since then, Lewis and Guns — who, after years of acrimony, buried the hatchet in 2016 — have forged ahead as L.A. GUNS while Riley focused on other projects. The Guns-Lewis version of L.A. GUNS released a new album, "The Devil You Know", on March 29 via Frontiers Music Srl.